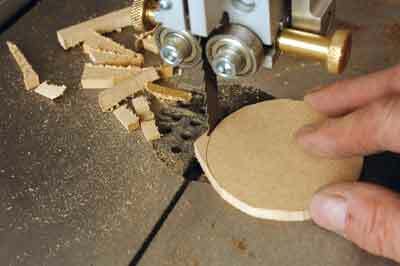 One of the nuisance things about bandsaws is the factory supplied insert. 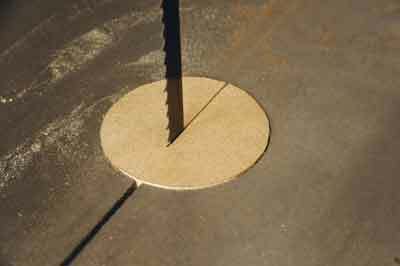 Often it will be too low in the table, so workpieces catch on the edge of the casting and the blade slot is massive to allow for tilting the table, but it then traps wedges of wood. There are different ways of dealing with this. One is to fit a sub-table over the cast table, made from kitchen worktop it has more 'slip' than cast iron. 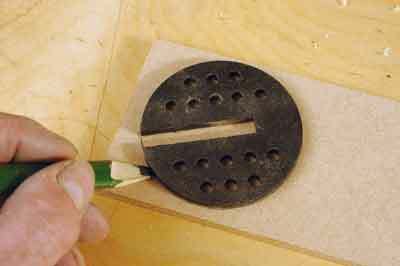 The other is to either rout a new insert using a homemade inboard trammel or my quick method shown here. I simply marked around the existing plastic insert, aware that it would be slightly too big as the pencil line is outside the rim line. A piece of 6mm MDF seemed ideal for this job. The circle is cut to the pencil line; it doesn't matter if it is slightly uneven. 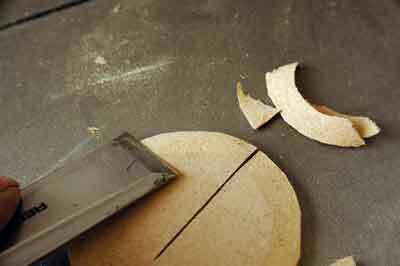 The next step is to use a sharp chisel to trim the MDF insert to a neat circle using the original as a guide for the blade. With the plastic insert in place, its replacement is carefully run on to the moving blade, sighting it so it will stop in the correct place. 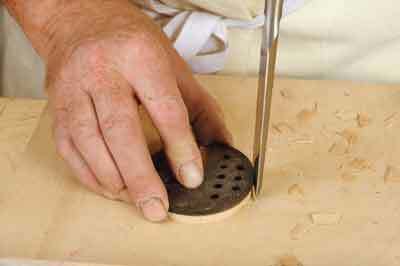 The underside is pared with a chisel so it will sit level in the opening. It doesn't matter if the front edge is a fraction low, but it must be flush at the rear edge to prevent catches. A big improvement on the plastic insert!